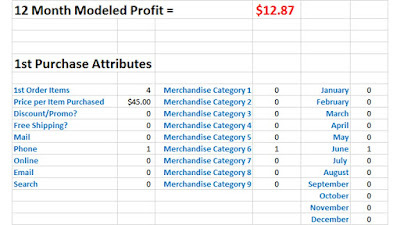 Now, let's assume that the customer purchased from Merchandise Category 3 instead of Merchandise Category 1. Let's swap out Merchandise Category 3, moving Merchandise Category 6 in instead. Now that you know this, there are several things you would be willing to do, right? You feature Merchandise Category 6 items in your prospecting catalogs (you use prospecting catalogs, right?). You gladly pay more for keywords from Category 6. You pay less for keywords from Category 3.